Ugh wash! by Gary A. Overpriced for what it offers: It's just a regular old body wash. by Forever Hers! I really enjoy the five Dona products I have tried already. As I'm writing this, Eden does not carry the full line of products but I am hoping that they add them soon. I imagine that I am going to wind up getting them all so I can layer them based on my mood. I'm giving this only four stars because it didn't feel gritty enough to exfoliate as well as I like. However, I was using the body polish too and that did a great job! It is very important to note that when you see "Camu Camu" or "Pomegranate" or any other name on these products - these are NOT the names of the scent of the product. These are the names of the APHRODISIAC INGREDIENT that was used in the product. The scent may actually be quite different than the aphrodisiac that is listed. It is important to read several reviews to get a feeling from the reviewer of how the scent smells to them. A good example of this is Camu Camu which is a superfruit with a very high vitamin C content. In the Camu Camu products you would think this means a citrusy/fruity smell but that is not true for most of the reviewers on Eden and on the company's facebook page. Instead, Camu Camu is being described as a vanilla/coconut scent and one person (Cookie Monster Mike) is thinking he smells some pink lemonade in there. Needless to say, this will not be the Camu Camu scent that you would find in other products - like say Scenty's Camu Camu wickless candles. (I used to sell Scentsy and have the samples here). The company does not give out a description of the scents either because they find them to be "indescribable" and different on each person as they wear them. So please - as you read about these products, understand that what you might think is the "scent" is actually only the superfruit that is used in the product and not the intended scent description. I need to start out by thanking Cookie Monster Mike for introducing me to the Dona line of products by System JO. When I first saw that Eden had added them, I didn't even really bother to look. After all, I had No Soap Radio products that I love - what more could there be? Thanks to Mike, my budget is now blown, my wishlist is pages longer and my bathroom has a new organizing unit for my bath and body products. Here is how it looks so far. I say so far because I now want every fragrance and most products in this line of products. Since there are 20 products in a variety of 6 fragrances (not all are sold on Eden at the time of writing this) - I either will need another shelf unit (perhaps I can take OUT the toilet) or a new bathroom. As long as I don't have to try and add on a new addition to the house for my bath products, I think I'll be ok. Thanks Mike! I need another product line to fall in love with. I obviously didn't have enough bath and body products. So on to this product. What is it? Why did I want to write about it? Let me start out by sharing the products and rituals in the Dona line. First of all, Dona is an "aphrodisiac infused line of sensual bath and body products designed to increase your energy, stamina and well-being". 1. Relax- "slow down and set the sensual tone"
3. Nourish - "to make your skin touchable and kissably soft"
4. Illuminate - "to enhance your natural beauty and space"
5. Engage - "to share the fun with sensual, play products"
Pomegranate (keeps the skin young and gives you energy and vibrancy). These descriptions are taken from information that Dona has provided me with. It is several pages which describes each product and the aphrodisiacs, etc. This product is the body wash which is part of the line of products for the second ritual. I'm sorry that I'm not starting at the first ritual, but when Mike contacted me about these products and I read his description of the mangosteen scent, I immediately grabbed five items for my order that I was sending in that day. Unfortunately, three of the five items are from the second ritual. This is one of them. This is designed to be used daily as a gentle exfoliating body wash. I recommend using it with a bath pour or loofa to help it lather up better. I love the fact that the scent is "unisex" enough that my husband and I could shower together with this and both use it at the same time. The company representative and I corresponded a bit about some questions I had with the product line. One of my concerns was glycerin. She stated that the glycerin in their products is vegetable-based glycerin which does not cause problems like animal-based glycerin does. As with any bath and body product, please do a patch test first to see if you will have any reactions if you suspect you might have allergies to something in this product. It is important to note that at this time Eden does not carry all of the products in this line. For instance, there are body butters available but Eden does not carry them. 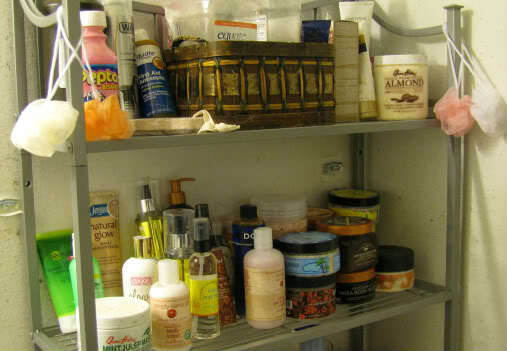 They also do not carry all of the fragrances in the products that they do carry. I do not know why this is. This product is cruelty free, paraben free, "natural" and free from petrol derivatives per the label. This is a gel-based body wash. To be very honest with you, I don't find it to be exfoliating like I think of when I remember other gel based body washes I have used which had more grit in them. Here is how it looks when I use one pump of the product. 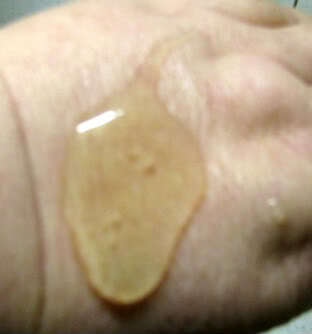 It is not a thick gel - and it is not an overly thin gel - but it is runny. If I wasn't so much in love with this product that I want to use it and use it and use it some more - probably one pump or at most two pumps on my pouf would be enough for my whole body. Cookie Monster Mike tried to describe the mangosteen scent in his review and he called it a "tropical fruit explosion". I spent a great deal of time sniffing the various mangosteen scented products and I have to say that he did a good job with that description. My problem is that each product smells a bit different even though it is the same main scent. As I told Mike privately about the body polish when I received it, I could tell it was fruit and it wasn't sweet enough to be in the berry family nor tart enough to be in the citrus family. It also wasn't apple or pear scented. I finally decided that I felt like it belonged more in the melon family of scents and the more I smell it, the more I believe that. It is sweeter than a melon but closer to the scent of melon than any of the other fruits I can think of. The best part about it though is there is NO CHEMICAL AFTER-SCENT. None! I will say that of the five products I currently have in this scent, the body wash is not my favorite for the scent. It isn't as sweet and lively as the body polish is. It has a bit more of a heavy soapy scent to it. However, at least it doesn't smell like chemicals. I can live with that. One of the best ways to talk about the performance is to show how much it lathered up. It actually lathered up quite a bit more than that, however, my daughter refused to take any more pictures, stating simply, "it's lather mom". I found that when I used my hands to lather it up, I got more of the exfoliating effect than if I had used my shower pouf. I love the way the product lathers up and I love the way it fills the shower with the aroma when I use it. I also love how soft and clean my skin feels after using it. Thank you Dona for using a pump cap for this product. It makes life so much easier that I don't have to open a cap and push a tube to get this product into my pouf. It also helps me measure out how much I'm using and I love that features too. The body wash comes in a bottle that holds 9.5 ounces. You can see it below next to a 20 ounce water bottle. When you consider that it only takes one or two of the measured pumps to clean your whole body (and I'm a big gal), I think that this a great bargain for the price you pay. I want to take a moment to deal with the whole idea of aphrodisiacs. Are they real? Can they be proven to work? Do they work as a scent? Will they actually go into your body if they are in the product? I don't have an answer to this and all the googling and searching I was able to did nothing to help me. I do know that at this point the FDA does not have any regulations for "aphrodisiacs" and it seems like if it could be proven that they work I'm sure that our government would love to find a way to regular them. The company spokesperson I spoke with stated that the company had done research into this and found that aphrodisiacs work when used this way. Of course, as a lowly researcher with no scientific training in this field, I'm not sure I could have understood the studies even if they had been provided to me. So as I write this review, and all other Dona reviews, I am basing my rating of the review of the quality of the product and if it does what it is supposed to do. I also base my rating on the scent and the way it makes me feel. In other words, I am putting aside the whole "aphrodisiac" quality of these products because I can't prove nor can I disprove their claims. At this time, Dona's website is not set up, so I am hesitant to share it here. However, if you want to find out more information about the products, you can go to their Facebook page and interact with them there. They're great about answering questions. I have found out that mangosteen is used in two "fragrances" that folks may recognize. I have never heard of the first fragrance and I do not know how easy it is to find these fragrances. However, I want to share them here so that if you recognize them and have smelled them, it might give you an idea of what mangosteen smells like when used in a fragrance. For men, the scent Paradox for Men by Jacomo uses mangosteen as one of the three scents that are part of the middle notes of the fragrance. This fragrance came out in 1999. For women, With Love by Hilary Duff which came out in 2006, uses mangosteen as the middle note in the fragrance along with Cocobolo wood. I'm also researching the other scents in the Dona line for future reviews of other scents. I would like to close this with links for some information on mangosteen. In 2007 for the first time, fresh mangosteens were sold from speciality produce stores in New York City for as high as $45 per pound. Fortunately, prices have gone down since then. Thanks for the reivew!! I've been going through reviews all night trying to get more information on the scents so I could choose one. Once I read the part about mangosteen being in the With Love by Hilary Duff I knew this was the one for me. Great review. So helpful! Anyone familiar with the new Dona line? Thank you for viewing Dona body wash – soap review page!